My daughter isn't yet three years old, but when I got her out of bed she asked me if it was Christmas morning. After all, we're at Grandpa and Grandma's and there's a tree with way too many presents under it..what other morning could it be? Whether you celebrated Christmas over 12 days, two days, or just one, or choose Hanukkah, Kwanzaa, or another holiday as your own this season, there's a lot of excitement leading up to the big day. Kids love this — they thrive on it. But they tend to get less sleep than usual and eat more sugar, which only fuels their excitement and joy. The problem comes when the holiday is over, the presents are opened, the meals eaten, and everyone is back in their own homes. Kids often feel the opposite of all that excitement and get dumpy, grumpy, and just plain difficult to be around once the holiday is over, and the new year arrives. While many of us feel this post-holiday letdown, kids don't understand it, making it harder for them to deal with their difficult feelings. Fortunately, there are a few things we can do to make this time easier for our kids and to help them deal with their difficult feelings. In our family, we're lucky in a way, because we have two early-mid January family holidays. 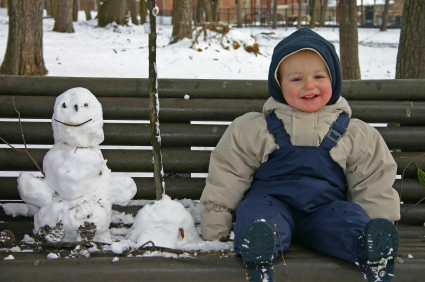 Even though Christmas is over, these give our kids a few things to anticipate. Even if you don't have birthdays or other happenings, though, you can give your kids something to look forward to. Plan a trip to the zoo, or even make a big deal out of an outing to the mall or to a friend's house. When kids have something to anticipate, many of their "let down" feelings will evaporate. They'll channel that energy into looking forward to something else, and forget all about the fact that the big holiday is over. It sounds a little cheesy, but showing kids how much they have (and, sometimes, how much they received on the holiday) can help them move beyond their negative feelings. When your kids don't know what to do, remind them of the new toys they have to play with. If they feel like there aren't many, toss them all in a pile so your kids can see, literally, how much they received. Sometimes, it helps to have your kids write Thank You notes for what they've received. I say "sometimes" because it's easy for this to turn into a chore that leaves real gratefulness out of the picture entirely. If you want to help your kids find gratefulness through the writing of Thank You notes, think about applying the following ideas. One or two notes a day is less of a chore than 15 or 20 at once, and will allow your child to personalize each one. You can even pick a time each day to sit down and write. Talk with your child about each gift they received and why it's special, and then help them include that in their note. When you use a gift you've received, talk about why you're thankful for it. This will help your children understand why they might be grateful for their gifts, too. Get special cards, and fun pens and pencils. You can involve stamps, crayons, markers, glitter, and anything else you can think of. This can help turn a dreary project into something that kids look forward to every day. When you notice your kids getting out of sorts or grumpy, take some time to sit with them and talk about how you feel. If you don't know how to start, try, "It looks like you're feeling grumpy. I'm having a tough day, too." From there, you can explore exactly what they're feeling about the holiday past, and talk to them about how it's normal to feel blah after a big day. More than anything else, getting back into a routine will help your kids get past their letdown feelings. If you liked the routine that you had before the holidays, getting back into it will give your kids a feeling of security. The excitement may be over, but at least they'll know what to expect out of each day. If you didn't like your previous routine, figure out how you'd like things to be structured and implement a new plan. As you discover what works and what doesn't, you can make changes, but the important part is that your kids will have a structure to their letdown days. It's can be difficult to help kids deal with their feelings of letdown when you're struggling with your own, similar feelings. Making the effort to help them process what's going on will make things easier for you, and give you more space to process your own feelings. I'm brand new to parenting and learning what it means to be "Mama" one day at a time.